phpFormGenerator is an online tool for creating a professional web form. Users do not need to have any knowledge of programming to use phpFormGenerator. phpFormGenerator will automatically generate the HTML code, PHP code for the form and the validation code through its system. There are a number of ways phpFormGenerator can deliver the code for the web form to the user. Users can have the option of delivering the form code to their email address or sent to the MySQL database or download it in .xls for format. If you want to have the code deliver to your email, you should fill in the email address in the textbox provided. If you want to save it to your computer, fill in the name of the file in the textbox provided. If you want to write it to a database, fill in all the required fields including hostname, username, password, database, table and email. phpFormGenerator allows its users to create multiple pages form. To add a page, click on the add a page hyperlink. To delete a page, click on the delete hyperlink. Users can add all sorts of fields to the webform such as textbox, drop down menu, checkbox, radio button, date, password, file attachment, email address field, telephone field, text field, and website address field. Users can name the field and add a Tool tip to each field in your web form. You can also protect your form with CAPTCHA code. After that, you should fill in the confirmation once the form is submitted. There is an optional field to enter the redirect address once the form is submitted. You can also set the color options for your web form including background color, header background color and header font color. Below the phpFormGenerator, you will be able to preview the web form you have created. When you are done, click on the update button and download your form. Unzip the files you have downloaded and upload them to your hosting to use it on your website. 2. Click on phpFormGenerator in the Other Scripts section on the left Navigation bar. 5. Enter the name of the directory where you want to install phpFormGenerator in the Install in directory textbox. If you want to install it on the homepage, leave the textbox empty. 6. 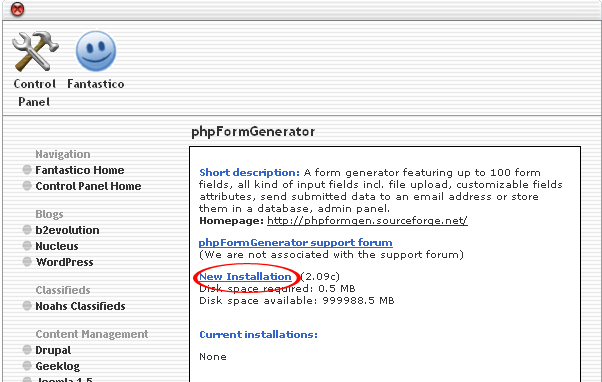 When you are done, click the Install phpFormGenerator button. 7. Click the Finish Installation button. 8. phpFormGenerator is now successfully installed. 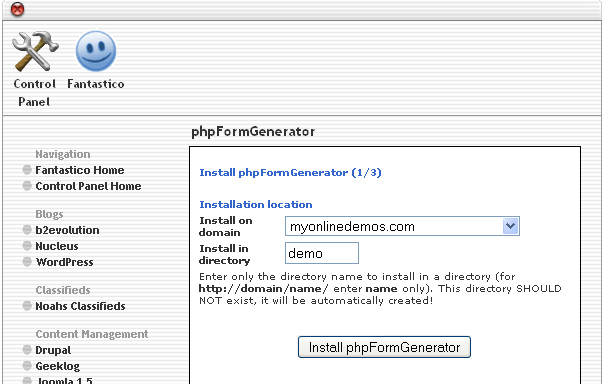 By following the steps above, you will be able to install phpFormGenerator through Fantatisco on your website.